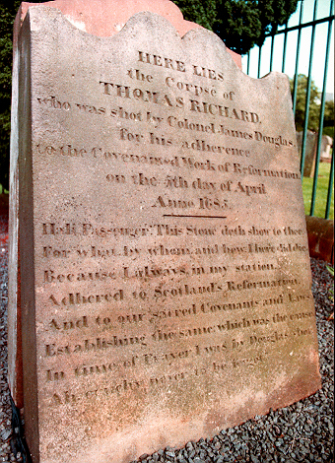 Close to Rev Alexander Peden’s grave in Cumnock is the resting place of Thomas Richard, an eighty-year-old Muirkirk farmer, who was executed for giving shelter and food to fugitive Covenanters. He belonged to Greenock Mains farm and the soldiers under the command of Peter Inglis came to his house looking for him. His inscription tells us that he was shot on 5 April 1685 - this was probably by a firing squad under the command of Colonel James Douglas. The headtsone commemorating Thomas Richard is located within the same enclosure as the Peden Monument.